Conjunctions are used to express relationships between things in a sentence, to link different clauses together and to combine sentences. The use of conjunctions is crucial for the construction of meaningful and fluid sentences in the language of speech and writing. There are four main types of conjunctions: coordinating conjunctions, subordinating conjunctions, correlative conjunctions, and conjunctive adverbs. There are seven coordinating conjunctions. and, but, for, nor, or, so and yet. FANBOYS –> F – for, A – And, N – Nor, B – But, O – Or, Y – Yet, S – So. One of the most used words in English is ‘and‘. It can be shortened by “&” sign in English. It means in addition to. And is used to connect words, phrases, or clauses that have the same grammatical function in a construction. He came in the house and the phone began to ring. I have one dog and three love birds. I work in a post office. And I also work in a library. Please calm down, Let’s wait and see. The meaning of But is however. It is used to show a disagreement between clauses, or to connect ideas that contrast. Also But means “except” when it is used after words such as all, everything/nothing, everyone/no one, everybody/nobody. I have got a home, but I haven’t got a car. I go to work on Mondays, but I don’t go to work on Saturday. He is very good at playing football but not at riding a bike. Emmy goes to bed early, but She is always late for work. He loves to read books on that date, but he hates taking notes. He said he would live with his family, but he gave up after that. He doesn’t want to buy any electronical devices, for they are very expensive these days. My teacher loves me very much, for I am a successful student. she gets weight easily, for she eats everything very quickly. Scientists are trying to find a new livable planet, for the world is coming to the end. It means and not. Nor is used before the second or last of a set of negative possibilities, usually after “neither”. She didn’t talk to her friends nor did she call her family. He can’t attend the meeting and nor can Ally. Neither Klevin nor Janny were at the school yesterday. Neither my son nor my daughter like drinking milk. Today is neither the first nor the last day of the month. Neither my parents nor my friends supported me. It means either. Or is used to connect different possibilities. Sally lives in London or New York. Which color do you like red or blue? Does Clark have any brothers or sisters? Teenagers need to sleep seven or eight hours a night. We can cook soup for dinner, or we can just eat leftovers. She study hard for this exam or she fail. I will go to the party or stay at home. It doesn’t matter whether you win or lose. What the most important thing is to you take part in the competition. It means but. Yet is used to introduce a contrasting idea that follows the preceding idea logically. Tomy plays basketball well, yet his favorite sport is football. Supporters of both teams complained about extreme heat, yet they continues to watch the match. I really wanted my son to study at university, yet he left the school. She lost the racing, yet she was happy to take part in such a contest. the things you experience are really difficult, yet you should be patient. It means therefore , for that reson. So means with the result or consequence of something. She was sick, so she couldn’t attend the meeting. I studied hard, so I will be successful in the exam. My daughter is very smart, so everybody likes her. He has a job interview, so he will go to London. Jack has changed, so much over time so nobody can know him. I don’t feel myself good, so I don’t want to go anywhere. 1. 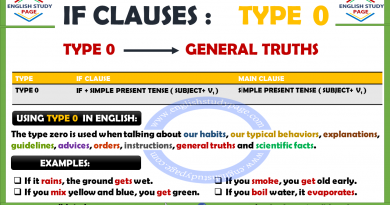 When we connect two main clauses with a coordinating conjunction, we use a comma before the coordinating conjunction (unless the two independent clauses are very short and well-balanced ). 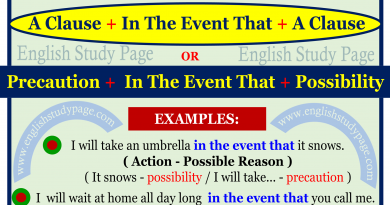 Main Clause + , + Coordinating Conjunction + Main Clause. 2. 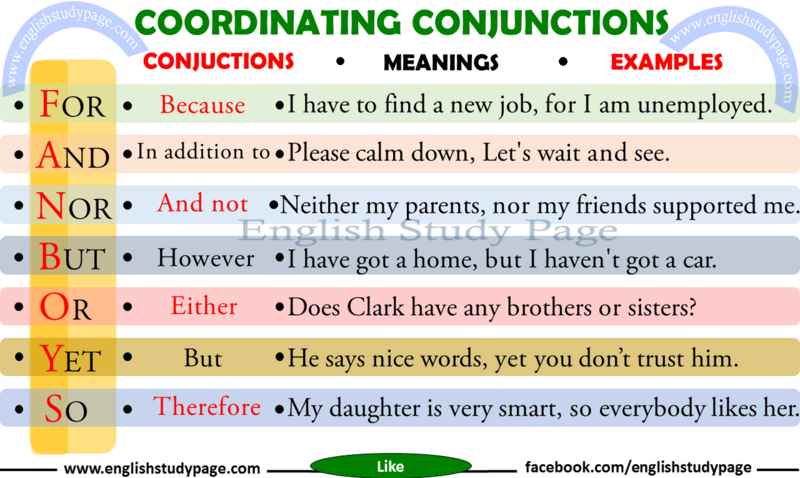 If we use a coordinating conjunction to connect any two items ( These items can be any grammatical unit except main clauses like two verbs, two subjects, two complements, or two objects), we don’t use comma before the conjunction. There is an apple and a banana in the fridge. Would you like cake or biscuit? He is very handsome but very angry. 3. When we have three or more items in a series, we generally use a comma before the coordinating conjunction. But it is optional. You do not have to use it. He likes reading poetry, novels, and stories. she washed the glass, fork, and knife. 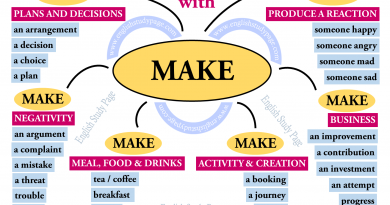 Note: Can we use coordinating conjunctions at the begining of a sentence? or Can we star a sentence with coordinating conjunctions? rarely. Before using this, As a student you should ask your teachers what their preferences are. You should use a coordinating conjunctions with a main clause. The government took sensible precautions against economic crisis. Yet these weren’t sufficent to improve the economy in the country.